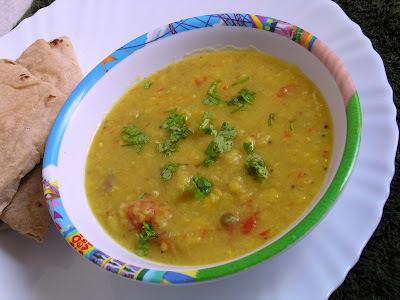 Masoor dal is boiled in a sauce pot along with chopped tomato. When the tomato is soft and dal is transparent, cooked spinach is added and is seasoned with spices. 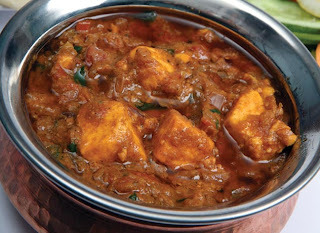 Serve tomato spinach dal with steamed rice or with roti. Makes: around 4 Servings of Tomato Spinach Dal . Wash and roughly chop spinach leaves. Refresh masoor dal with water. Bring to boil 2 1/2 cups of water, add masoor dal. Boil till masoor dal just turns transparent, add chopped tomato, green chiles and turmeric powder. Boil till tomato turns soft and season the dal with salt. Heat oil in a pan on medium heat, add all ingredients in order. When mustard seeds start spluttering, add spinach leaves. Fry till spinach wilts, remove from heat and add to the masoor dal pot. Boil for around 5 minutes and remove from heat. Serve tomato spinach dal with steamed rice or with roti. Notes: Make sure to cook the spinach leaves well. This is a quick and tasty chaat with corn. Use boiled corn and briefly stir fry it with chaat masala powder. Garnish with cilantro and serve warm corn chaat immediately. Makes: around a Serving of Quick Corn Chaat. Corn Kernels 1 Cup app. Boil the corn or steam it till its soft. Use a knife to chop off the corn kernels from the cob. If using canned corn, wash the corn and strain it. Heat oil in a pan, add corn and fry for a minute. Stir in chaat masala, amchur powder and salt. Fry for couple more seconds and remove from heat. Sprinkle red chile powder and garnish the corn chaat. For spinach potato paratha, grated potato is cooked along with green chiles and spinach in oil along with spices. The cooked spinach potato mixture is then stuffed into wheat dough and rolled out into thick parathas. 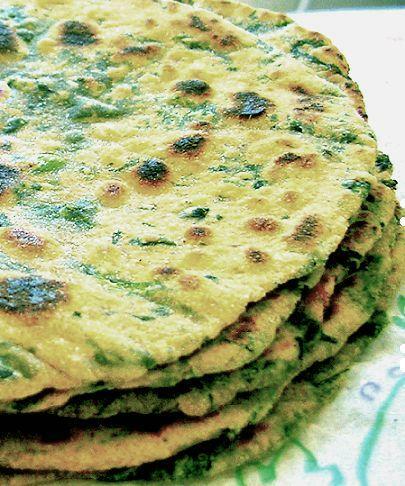 The spinach potato paratha is cooked on flat pan until its golden brown on both sides. Makes: around 4 Spinach Potato Parata. Peel, wash and grate the potato. Remove stems and wash and finely chop the green chiles. Heat quarter tsp of oil in a pan, add mustard seeds and cumin seeds. When mustard seeds start spluttering, add chopped green chiles and grated potato and fry briefly. Stir in chopped spinach and salt and cook covered for few minutes. Uncover, cool the mixture to room temperature and divide into 4 portions. Knead wheat flour into somewhat tight dough with few pinches of salt using enough fresh water. Keep the dough covered with wet kitchen towel for half an hour. Divide the dough into 3 – 4 portions. Take each portion of wheat dough, press it a little to form a small disk. 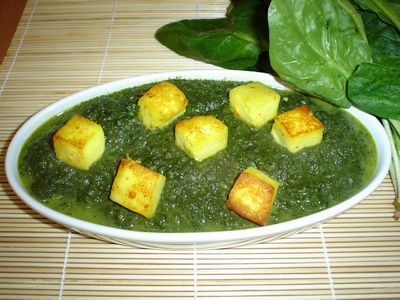 Take around a big spoon full of cooked spinach potato mixture and place it on the disk. Now bring together the edges of the dough and press it to form a ball. Carefully knead each dough ball into around 7 inch diameter disc with help of a rolling pin. Repeat the same with remaining wheat dough portions. Heat a flat griddle on medium heat, brush half a tsp of oil all over the griddle. Place the paratha on hot griddle and let it turn golden brown. Add quarter tsp of oil on uncooked side and turn it over to let it cook. When both sides are cooked properly, remove spinach potato paratha onto a plate. Repeat the same with remaining rolled out parathas. Serve hot spinach potato paratha with mango pickle and with any raita of your choice. Potato fritters are prepared by dipping the sliced potato in gram flour batter and deep frying them in oil till golden in color. Then the potato fritters are stuffed with finely chopped onion, spices, herbs and peanuts. Finally lemon is squeezed to finish it off. Serve potato fritters chaat immediately. Makes: around 5 Potato Fritters Chaat. Peel, wash and slice the potato into thin circles. Make sure the circles are not too thin and soak them in cold water until required. Clean, remove hard stems and finely chop cilantro. Grind the red chile and a tbsp of chopped onion into coarse paste with enough salt. In a small bowl, add red chile onion paste and stir in potato slices and leave aside for few minutes. Heat oil in wok on medium high heat for deep frying, add few pinches of salt. In a mixing bowl, add besan, few pinches of red chili powder, salt and soda-bi-carb. Add sufficient water little by little to make thick flowy batter almost having honey like consistency. Dip each potato slice in besan batter making sure the batter is coated on both the sides of the potato. Remove the dipped potato slice from the mixing bowl and slowly drop into hot oil. Potato slice should sizzle once it hits hot oil else oil has not reached required temperature. Repeat the same with other potato slices. Fry on both sides until light golden brown and remove the potato fritters on to kitchen napkin. Once warm enough to handle, slit each fritter in the middle making sure not to cut it into half. In a mixing bowl, mix thoroughly chopped onion, roasted peanuts, cilantro, salt. Stuff the potato fritters with spoonful of the prepared chopped onion mixture. Squeeze few drops of lemon juice on each stuffed potato fritter. Layer a big pinch of red chile powder and little salt on each potato fritter. Serve potato fritters chaat as a snack with few wedges of lemon on the plate. Notes:Make sure potato fritters are fried properly before removing from heat. Heat ghee in a pan, add vermicelli and fry until golden brown. Bring milk to boil in a heavy bottomed pan, add fried vermicelli, pistachios and saffron threads. Cook until vermicelli turns soft and transparent. Stir in sugar, mango pulp and cook until sugar has completely dissolved. Notes: Make sure not to add too many saffron threads. Slice the paneer and capiscum into thin long strips. Pound the coriander seeds and chillies together. Heat the ghee add the garlic paste and cook on a slow flame for a few seconds. Add the capiscum and the pounded spices and cook on a slow flame for a few seconds. Add the green chillies and ginger and fry again for a few seconds. Add dry fenugreek leaves and salt and fry again for a seconds. Finally add the sliced paneer and cook for a few minutes. 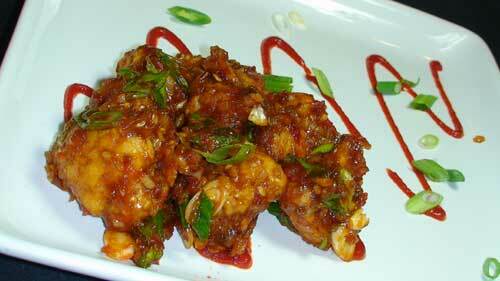 Take onion, chillies, ginger garlic and puree them in the mixer. Take about 2-3 tbsp of oil in a wok and to this add cumin seeds and finally add the onion garlic paste to this and keep frying till golden brown in colour. Once the oil starts to leave the wok add tomato sauce to this and keep frying till the oil leaves the sides of the work. To this add chilli powder, coriander powder, turmeric and stir well. Add a little cream to it and add garam masala. Finally add milk and keep stirring till it begins to boil. This is important because if not stirred well then the milk might cuddle. Add water to this and salt sugar and finally add the fried potatoes and let simmer for about 15-20 minutes. Check tenderness of potatoes with a fork and finally add cashews to this. Pressure cook the potatoes with their skin, peel, mash and set aside. Wash the spinach or amaranath leaves and chop fine. Heat 3 tsp oil, add the mustard seeds and the curry leaves. When the mustard seeds splutter, add the cummin seeds, channadal and saute for a couple of minutes. Add the chopped spinach and sprinkle water. Cover on a low heat tilll the spinach is tender and dry. Add to the mashed potatoes, turmeric powder, salt and chilli powder. Mix well. Cook for a minute, till everything blends well. Butter two slices. Liberally apply green chutney on the unbuttered sides of both the bread slices. On one of the slices, start layering with boiled potato slices, cucumber slices, tomato slices, onion slices and capsicum rounds. Sprinkle chaat masala pwd and black pepper pwd on top. Layer with a cheese slice (optional). Top with the bread slice and toast till golden brown. Serve warm with tomato ketchup. Green chutney recipe: Grind 1 cup chopped coriander leaves, few mint leaves, 1-2 green chilli, 1 tbsp lemon juice, 1 tsp sugar and 1/2 tsp salt to a fine paste, adding little water.